Is one of your goals for 2016 to reduce your carbon footprint? It's easier than you may think -- and it doesn't have to be a sacrifice. There are so many little steps you can take around the house that add up to big environmental benefits. I've gathered a list of 12 things you can do right now (or implement one a month for the next year). Have fun being green! Clean your refrigerator coils. This will help the refrigerator run more efficiently, and that saves energy. Cleaning the coils isn't something you think about much, but it's not hard. Just pull the refrigerator away from the wall, vacuum the dust out of the coils and wipe with a damp cloth. It will take 10 minutes at most. Keep your freezer full. A full freezer runs more efficiently than an empty one. You don't have to fill it with ice cubes and frozen dinners. There are a lot of things you can freeze. For example, milk freezes beautifully. So buy a bigger jug of milk, keep what you need and freeze the rest in mason jars. Rice also freezes well. I cook up large batches and then freeze single servings for when I need them. Use cloth napkins instead of paper napkins at dinner. They're prettier and don't fill up the landfills. And if you're a dainty eater, you may get several uses out of one napkin before you need to wash it. Change out your light bulbs to light-emitting diodes (LEDs). They use less energy and last longer. Yes, they are expensive. But they are worth it. Cold this winter? Before you turn up the heat, try layering. An extra sweater or a fuzzy blanket will keep you warm and cozy... and save on your energy bill. If you need to buy a new appliance this year, make it an Energy Star-qualified one. Even if they cost a little more, they'll save you on your electricity bill in the long run. Stop using disposable roasting and baking pans. Sure they're convenient, but they're expensive in the long run and create waste. You can get a nice roasting pan for around $15. And a bonus--they are much sturdier. Taking the turkey out of the oven is much easier! Repair leaky faucets and toilets. It is staggering how much water you waste with a small leak. A friend who let a running toilet run for a few months was a little shocked when her water bill came--it really adds up. Also, it's a good idea to install water-saving toilets and shower heads. Join Dominion's Green Power program and use energy from renewable sources to power your home. It costs a little, but more is worth it. Stop using your dryer sheets, which are loaded with toxins. A wool ball with a safety pin in it will stop the static cling. 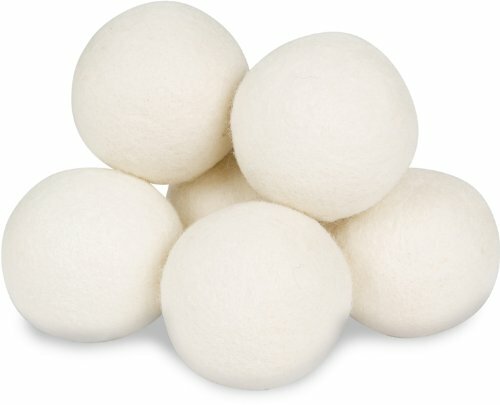 You can find all sorts of wool balls on Amazon.com. Buy a new houseplant. They really do help keep your air cleaner. Thinking of freshening the paint in your house? Use low or VOC-free paint. Not only is it Earth friendly, it's wallet friendly too. Bonus tip: Take your own mug to the Lake Anne Coffee Shop (or wherever you get your daily fix) -- some coffee shops will even give you a discount for bringing your own cup. See, it's easy to go green. What other tips do you have for an environmentally friendly home?